The Municipality of the District of Lunenburg (MODL) Council has voted in favour of taking the first step in arranging to have the abandoned boat, the Schwalbe, removed under the federal government's Abandoned Boats Program. The vessel has been aground in Feltzen South for the past four years and attracted the ire of at least one local resident. The decision at the May 22 council meeting overturns MODL's previous stand on the issue, which was not to get involved for fear of liability issues. 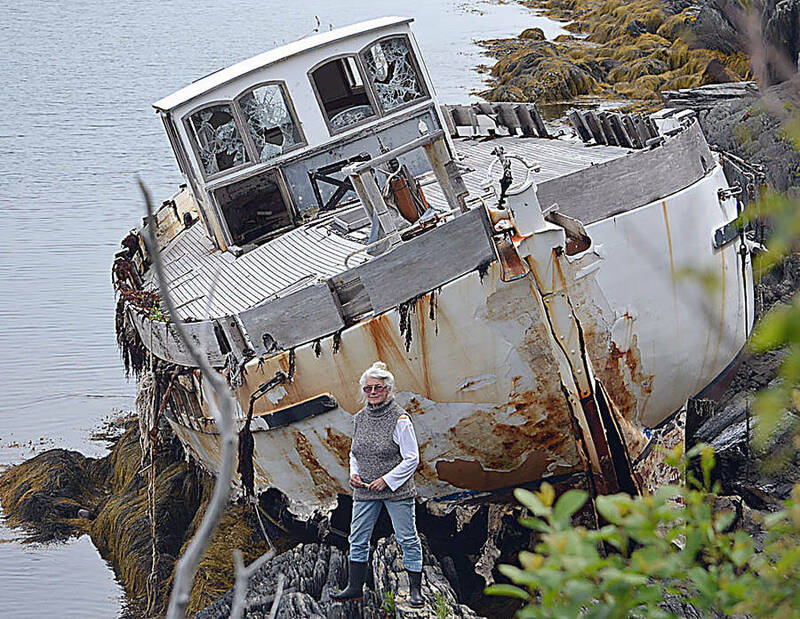 Last year council voted against making an application under the program to assist local resident Judith Atkinson, whose property has been lumbered with the abandoned vessel. Council members expressed concern about wording in the application which indicated applicants must take "possession" of the vessel. However, the federal government's Transportation Department Navigation Protection Program subsequently assured MODL's mayor Carolyn Bolivar-Getson in a letter that "the authorization for Transport Canada to take possession of an abandoned boat does not transfer ownership to the applicant. "The possession granted is for purposes of assessment only, and if funding is granted for removal and disposal, the authorization to take possession is likewise limited to the carrying out of these purposes only." Nonetheless, some councillors still had reservations about council agreeing to proceed with an application to have an assessment of the vessel. "I find that I'm very torn on this issue," said Councillor Eric Hustvedt. "We want to be helpful, we don't want abandoned boats on our shores. On the other hand, there is the issue of precedent." "I won't support a motion that the municipality get involved into it," advised Councillor Lee Nauss, expressing concern about potential environmental issues connected to the vessel . Councillor Reid Whynot was adamant council should move toward having the vessel moved. He noted he had thought the boat would slip away in the spring tides. "Well the boat's still there, and it is a hazard, and it's got to go." Referring to the letter from Transport Canada, MODL's chief administrative officer, Kevin Malloy, assured council members there is no liability concerning any environmental issues. "I don't believe there's anything there that obligates us, if we find something that there's some environmental assessment as a result of the boat being upon the shore. That is not our responsibility," Malloy said. "All we're doing under this program, under the parameters of this program is simply establishing the authority to go and have an engineer take a look at the vessel and determine what the cost would be to remove the vessel. And then it would enable us to make the application for funding for the cost to cover that." Previously, Atkinson told LighthouseNow she is both worried and annoyed by the vessel. Scavengers regularly comb the area around the boat, debris is breaking away and scattering on her property, youth come to party on and around the vessel, and tourists have even been knocking on her door and asking about the story behind the wreck. CBC News reported in June, 2014 that Schwalbe, its British owner Charlie Holland and his partner Somporn Chiangmanee landed in Halifax after they were blown 1,600 nautical miles off course in a storm while travelling from the Bahamas to Bermuda. According to that report, the 88-year-old vessel incurred $75,000 in damage. Stephen Bornais, a spokesperson with the federal government's Department of Fisheries and Oceans told LighthouseNOW, Holland then sailed the boat to Lunenburg harbour. Schwalbe had been moored at Lunenburg on February 1, 2015 when it broke free and drifted across the bay.